UPDATE: This restaurant has recently changed its name to Sol Semilla. 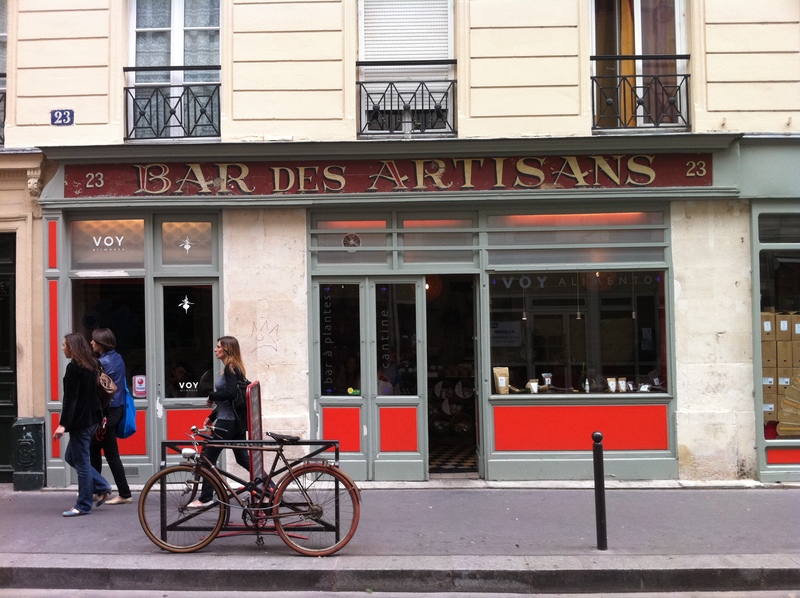 At the time of the review it was ‘Voy Alimento.’ It’s also sometimes referred to as “Bar des Artisans” due to their vintage signage. 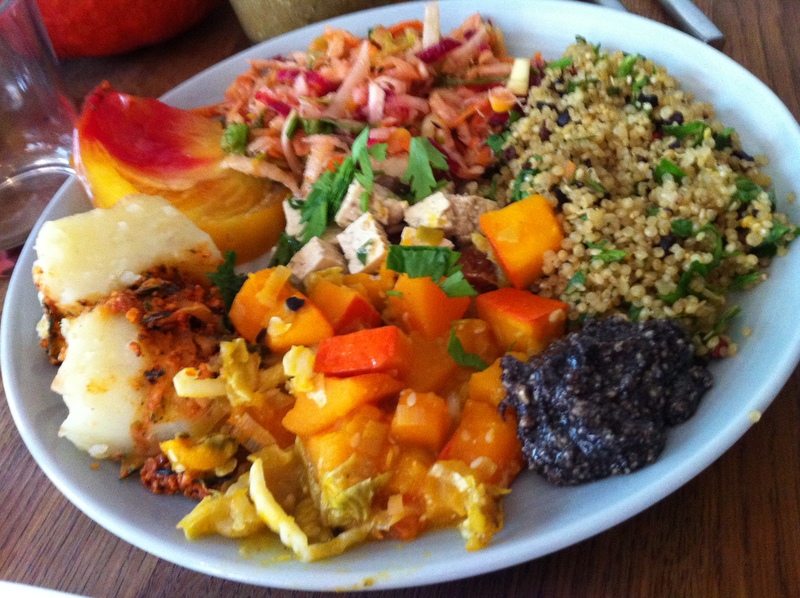 Sol Semilla is a rare and wonderful thing, a 100% vegan, 100% organic restaurant in Paris serving wonderful food in a welcoming and chic setting. 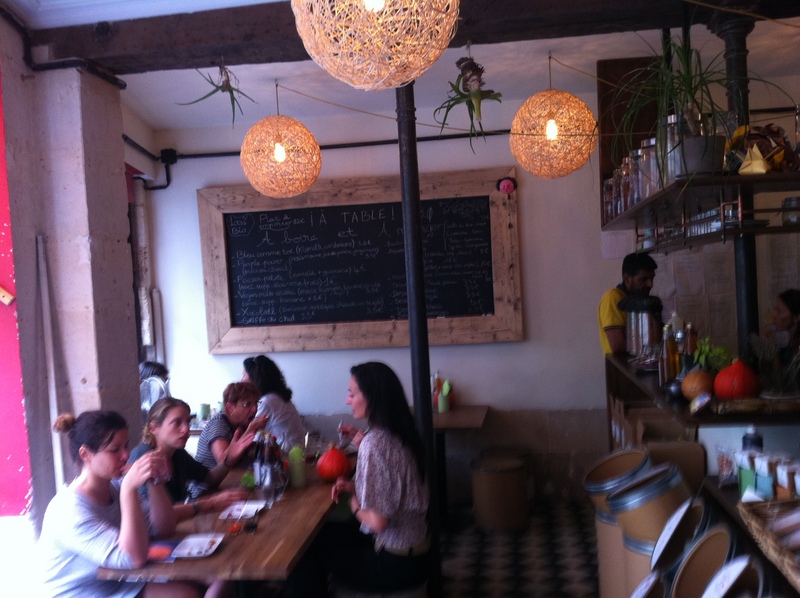 I’d always loved taking a trip to the Raspail Market and visiting the South American superfoods stand was always a high point, so during Summer’s trip back to Paris there was no way I was going to miss out on checking out their restaurant which has been open for a couple of years in the 10th, right by the Canal St Martin and walking distance from Place de la République. The setting is a small, cozy converted old bar decorated with earthy, rustic touches but in a minimalist way that keeps the space light and open. 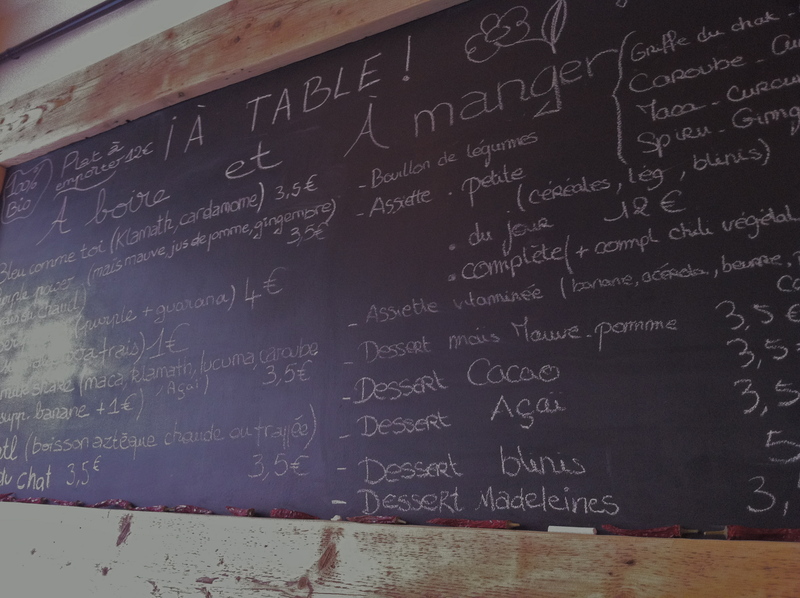 A large chalkboard takes up the left hand wall, while the right hand side of the restaurant is taken up by a store selling maca, yacumba and the like. We took one of the small tables, seated comfortably on small barrels while our delightful, English speaking server plied us with free samples and talked us through the exotic delights of Xacolatl Aztec chocolate drinks, Griffe du Chat herbal beverages, Klamath & Cardamom drinks, and also Blinis. Every element of dining here was a pleasure and they achieve a high-end dining experience while still being smiley and nice. 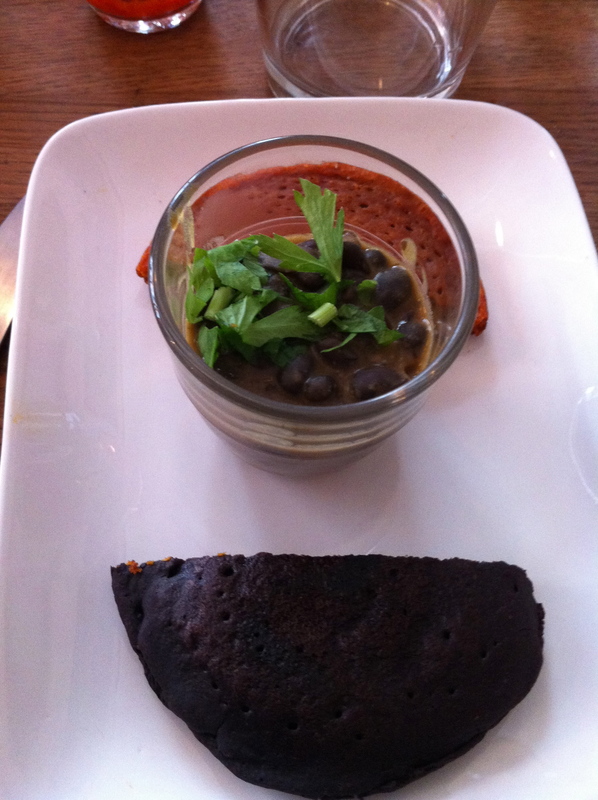 Next Next post: Vegan Paris Guidebook now on Kindle! Thanks for this tip! Heading to Paris in a few days and looking forward to checking this place out. Very helpful blog, thank you! I’m a vegan living in Paris for a year – THANK YOU SO MUCH FOR POSTING THIS BLOG UP!!! It is WONDERFUL!!! 🙂 Can’t wait to check this place out!! I do hope you see this message as I am not sure if you are still posting new blogs. Well, I am spending a semester in Paris and I was previously vegan. However once I arrived I decided to eat just as vegetarian. However, I am not comfortable with the diet. I truly miss being vegan as I find it weird and even unnatural to be eating things like cheese! So, I have decided to have a vegan lifestyle once again. I have been looking online and have found this blog to be very useful and even inspiring. However, I would like to see if you could give me some extra advise on eating vegan here in Paris. 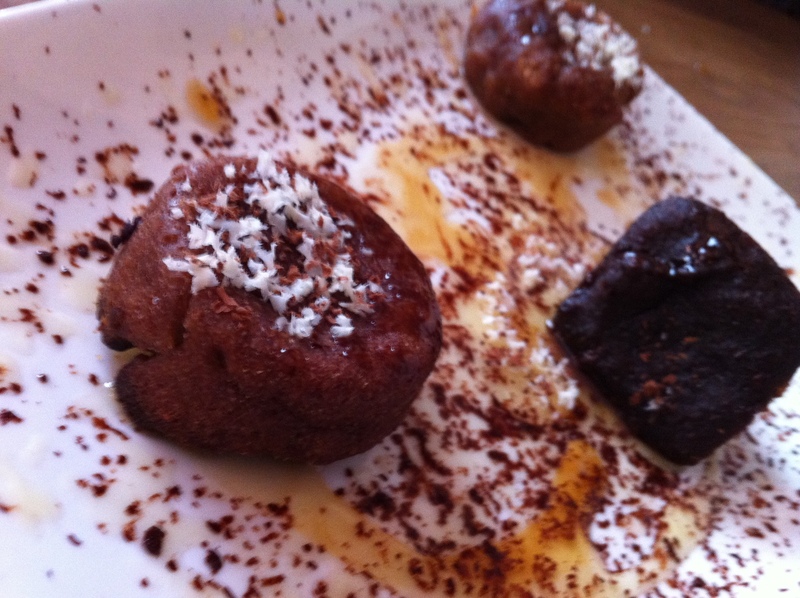 Are there any items in the patisseries that are made without animal products? Perhaps there are products that you recommend. “L’as du falafel”??? No way!!! It’s for tourists. Local people go just in front, at Mi-Va-Mi!!! Vincent, thanks for raising one of the most important issues facing the Paris diner: which is the best falafel shop in the Marais? As you ‘ll see in this post, I was a long time Mi-va-mi aficionado, but in my recent ebook, I did switch over to preferring L’As. 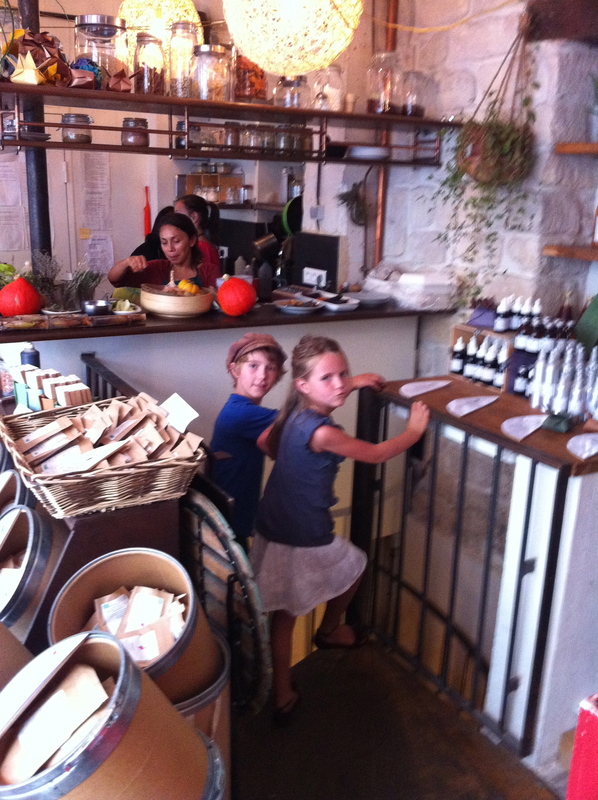 Mi-va-mi wins out on atmosphere, convenience, frites and friendliness. But I believe that L’As du Falafel just edges out Mi-va-mi on the quality of their sandwich. Having said that, if there is a line at l’As, then yes, one should probably just go to Mi-va-mi and have a great sandwich.